A comprehensive manual for the analyst (or chromatographer) for evaluating and using the various tandem systems obtained by combining different methods of chromatography and spectroscopy. It introduces the reader to the different separation techniques that can be combined with spectroscopic techniques. Gives essential details of the different interface designs that are necessary for each tandem technique. Provides practical examples of the use of each technique, describing the analytical performance and sensitivity in terms that allow direct comparison between techniques. In addition to describing research prototype tandem combinations, it presents commercially available systems. Offers many detailed diagrams to facilitate rapid comprehension. 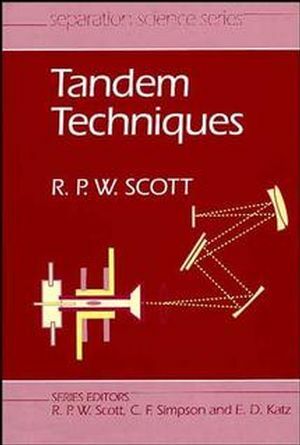 Raymond P. W. Scott is the author of Tandem Techniques, published by Wiley. Identification Techniques for Tandem Use. Gas Chromatography IR Spectroscopy (GC/IR) Tandem Systems. Gas Chromatography/Atomic Spectroscopy (GC/AS) Tandem Systems. Liquid Chromatography/Atomic Spectroscopy (LC/AS) Tandem Systems. Thin Layer Chromatography/Spectroscopy Tandem Systems.